There are certain things you expect to see when you turn on a child’s cartoon show, but watching the three main characters get tanked on one beer and stealing a cop car certainly isn’t one of them. 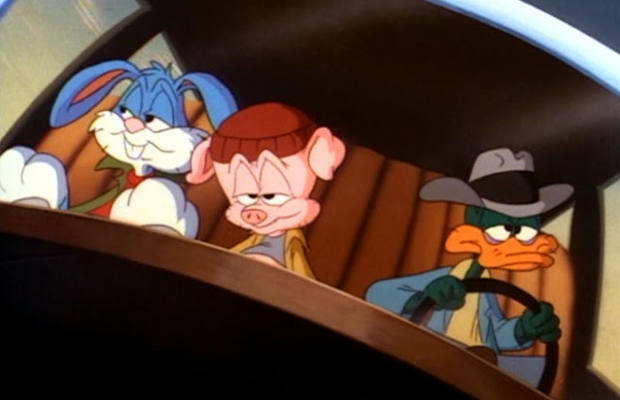 That’s exactly what happens in this now-banned episode of Tiny Toon Adventures, titled “One Beer.” The episode culminates in dark fashion when all three characters drive off a cliff to their demise while under the influence. We’re not kidding; the car is left a smoldering wreck and the three of them fly into the air with angel wings. We're sure their elevated blood-alcohol content made them burn up quicker, if that's any consolation. The ironic part is that this episode was supposed to be teaching kids about the dangers of drinking. In fact, Buster Bunny explicitly says so in the beginning of the episode. That didn’t stop Warner Brothers from pulling the chord on this episode after just airing it once. For the morbidly curious, “One Beer” was released on DVD, so if you want to plunk down some money, you can feast your eyes on the fiery deaths of three adorable cartoon animals.